It's and anime that has classical music! 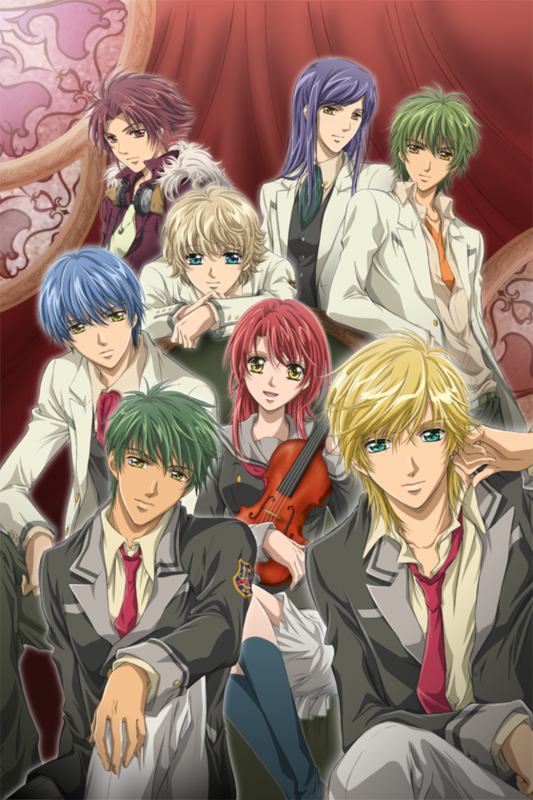 This anime makes you (if you ever played an instrument) want to pick up the instrument and start playing again. Very inspiring! I would have liked to see more of a ending then the cliffhanger ending of secondo passo part 2 however that is fine. I feel that being a anime and having classical music ( which i both love) makes it awesome. This was a lot of fun. Primo Passo in particular took its time to let you get to know each character and give everyone their own arc, which is something that is often missing in reverse harems. Admittedly, Secondo Passo was just created to advertise a game, so it's two episodes of not as good material. Overall there was good themes and good fun. Also, as a fan of the Suzuki school of music I really love how they made a point that anyone can be a musician if they have conviction, not talent. Give it a watch. I ADORE this anime. I was a huge music geek when I was a kid up through college, so this show really hit home for me (read: non-music major playing music in a heavy-music college.) I really identified with Kaho and I felt all the same drama she did over music and violin because I experienced it once upon a time (not so long ago). I super shipped her and Tsuchiura (?) the other violinist. LOVED those two. I just wanted them to be together. But seriously. Watch the anime. It's amazing. I just finished primo passo and secondo passo and while I loved the music, art and characters the ending has left something to be desired. I don't really get why they introduced 2 new characters in secondo passo... It added nothing. And what a disappointment the finals were after the build up of the whole competition. Plus no real romance at all. That being said I feel like I know a lot more about classical music and composers than I ever have before. Makes me sorta want to go out and buy a violin and play Ave Maria. Rika: Hello everyone. I must say this anime is by far one of the best anime dealing with music. Even though this was my first music anime, It was quite charming and eloquent in the greatest form of melody. However, it lacked something I believe we were all waiting to see....Love and romance. Even at its end, the people decided not to make Kahoko choose, but left it instead to the audience's imagination, which I found it quite ridicule. That is why I will give it and 3 out of 5. Thank you. This review was brought to you by rikaTakumi. This series showed us the value of music and it had a very unique character design. At first I didn't love the idea of her borrowing the talent of others, being that I play an instrument myself, but it really did evolve into a promising anime. I find the plot twist at the third performance intriguing and I love how eventually she puts in a lot of work to become an amazing Violinist. This took me by surprise. I did not think I would like this as well as I did. The story line is paired with beautiful music and takes you through an emotional journey as deeply immersed as you could imagine while listening to the soundtrack, eye's closed. I would have rated it a 3.5 if possible, only because, I actually did not watch they last two episodes (secondo passo) they just seemed like a repete of everything I had just watched, and failed to hook me in. I didn't want to ruin my opinion on this as a whole by watching them. This anime is great! Not only is it full of good looking boys (gonna fangirl here for a minute, sorry), but the heroine is a solid character full of life and charm. Not to mention, the musical selections in this show are well thought out and amazing to hear. Overall I think this is a good series. If you are a fan of reverse harem anime, this is one to check out. But it wasn't my personal favorite. It started out great. I enjoyed being introduced to all the different characters. It was hard to pick out a favorite. The premise was simple but solid. And there was a nice variety of characters and character interactions. Unfortunately, the series slowly goes down hill starting around episode 13 and I found myself laboring to finish the last 5 or so episodes to complete the series. I feel the series may have been better as a 12 episode anime though admittedly at 12 episodes it might have felt rushed. I honestly would say the plot fit about 18 episodes. The series really starts to drag in the later half and the ending felt rather anti-climatic. As for the music of the series. I was actually mildly disappointed. There is of course good classical music used in the series as it is a central part of the premise. But I've seen other anime such as Princess Tutu incorporate classical pieces a lot better than this series did. I was expecting more care given to the music of the series being that music is the main focus of the plot and what I got felt like a minimal effort. This is a matter of personal taste on my part. But it quickly became apparent that most of the plots and character developments across the varying characters were all self created problems. I don't mind some amount of self created problems as plot devices. The series does take place in high school after all. But watching the main character brood for 5+ episodes straight over something that a simple attitude adjustment would solve got rather annoying and was a key reason the series felt like it dragged terribly in the later half. And it's not just the main character with self created problems. About half the male cast is guilty of this as well. In fact in terms of actual conflict, there is very little in this story. You think at the start the main conflict will be about general studies students versus music studies students but that gets for the most part dropped after the first selection is performed. Instead you get a bunch of characters self brood over various things and each individually in turn gets over themselves solving their own problems.